1. The Breville Crispy Crust Pizza maker is one of those countertop pizza ovens that gives you the taste of a brick oven in your homemade pizzas. 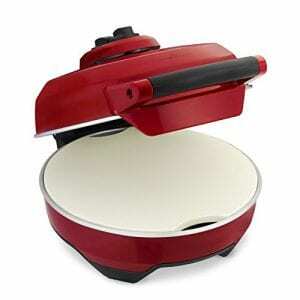 The pizza maker from Breville is designed perfectly in order to cook you the best-tasting pizzas within a few minutes. 2. This Pizza maker can be used to make pizzas with thin, medium and thick crust with the help of different settings and although it can take you a bit of time to get to know the pizza maker, once you get the different settings and how you can cook delicious pizza on them you would be good to go. 3. The pizza oven has a top and bottom heating elements and comes with a ceramic stone where you place your pizza. The ceramic stone enables heating up the base of the pizza and making it crisp while keeping the rest of the pizza chewy and well cooked. The temperature on the oven can go up to 660 Fahrenheit and hence you can easily heat up the oven in order to cook a quick pizza. 4. The diameter of the ceramic stone is 12 inch but you can cook pizzas which are 11 inches in diameter. The oven is perfect for making different kinds of pizza with different crusts and the flavor of the pizza is really amazing making these pizza makers one of the best that you have out there. 5. There are very few pizza makers out there that can nail making a thick crust pizza but this pizza oven from Breville does it and it does it perfectly. The cooking of thick crust pizza is perfect in this oven and if you are someone who loves to experiment with their crusts then the Breville Pizza maker is going to be worth every penny and more. 6. The pizza maker is easy to use and it is easy to understand the settings for a first time user of the oven. 1. It can take you some time to understand the settings and how you need to cook the thick crust pizza in order to get it cooked perfectly. Cooking a thin to medium crust pizza is going to be easy but you might have to figure out the ideal time and temperature that you need to give the thick crust pizza. 2. A few customers have complained that their ovens got issues and broke down within a year. However, there were very few people complaining about this and more than 90 percent of the users on Amazon found this oven the best one out there for making pizzas at home. The Breville Pizza maker is the best pizza maker you could possibly invest in and if you want to get the brick oven pizza flavor in your homemade pizza then this is the countertop oven you should be purchasing. Of all the pizza ovens, this one is easy to use and you can make different crust pizza easily once you get the hang of the settings and temperature needed by pizzas with different crusts. 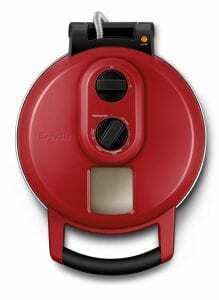 Most of the customers are satisfied with the purchase of the pizza maker and if you too want an oven that would give you the best homemade pizzas then do check out the Breville Pizza maker. If you have any experiences with this pizza maker then let us know in the comments section below as it is always nice to read people’s experiences. If you found the post helpful then share it on social media with friends. I’ve been trough my 2nd pizza maker, each time they just stoped functioning , after about 3 moths of calling Breville and trying to get them to replace the first one that was still under warranty , on the second one I went I just wrote a review about the poor reliability of the product and costumer service. Soon after the review somebody ( manager)reached up to me asking for the serial number and saying that they will replace it but almost 2 months after and still no word on the replacement. This is something I find really annoying. Thanks for sharing this with the readers as it would make them aware of the durability of the product. The major drawback on the affordable pizza ovens has to be the fact that they break down easily.